After performing a search in 1Search Plus, ShopKey Pro returns information within cards which relate to specific data sets. In this post, we’ll go over the Real Fixes card in 1Search Plus. What type of data is returned in the Real Fixes card? ShopKey Pro returns real-world information specific to your vehicle and search term. The icon in the lower right corner showing “SureTrack” signifies that the information in this card is part of the SureTrack real-world data set and exclusive to ShopKey. The purpose of a Real Fix is to provide diagnostic information to the technician in a concise, “silver bullet”-type format. 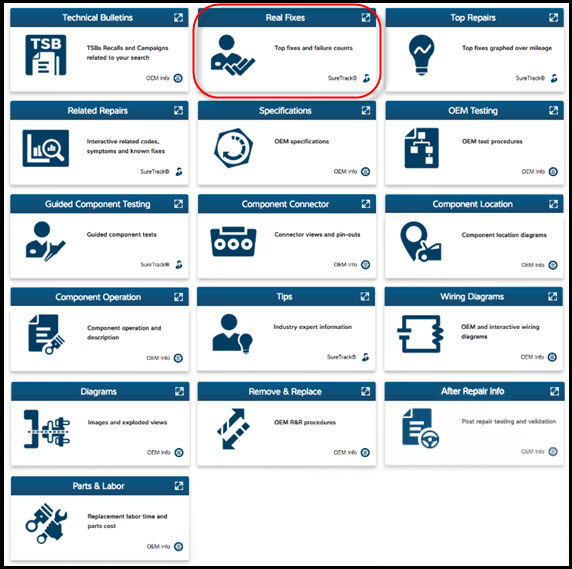 Each Real Fix is based on a code or symptom (or multiple codes/symptoms) and provides the diagnostic how-to in order to verify the component at fault. Real Fixes are formatted in a ComplaintàCauseàCorrection layout that is intuitive to follow for a technician. Where does the information for the Real Fixes come from? Real Fixes are built with real aftermarket repairs from actual auto repair shops. ShopKey has a database of over a billion repair orders that our diagnostic editorial staff (current and former diagnostic technicians) uses to create each Real Fix. We connect the code/symptom on the repair order to the component replaced, making a connection based on the real-world experience of that vehicle in the aftermarket. 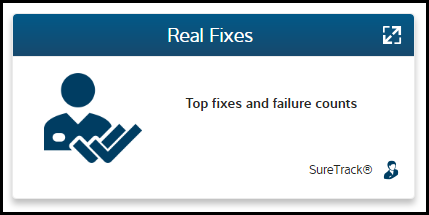 The staff adds their personal diagnostics knowledge to create the library of Real Fixes you see in ShopKey Pro today. 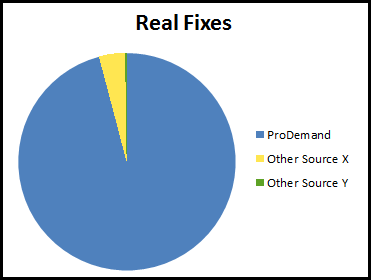 How many Real Fixes do you have? At the time of this writing, ShopKey has over 37 million Real Fixes. Take a look at the chart below showing that ShopKey Pro is the market leader of the total number of real-world aftermarket Real Fixes available to technicians. What sets the Mitchell 1 Real Fixes apart from other products? Every job requires a repair order, but not every job requires a call into a diagnostic hotline. Because of this, ShopKey has visibility to the full range of diagnostic jobs occurring in the aftermarket. From the common place to the unique and rare, ShopKey gives you the full spectrum of probable causes to aid in building your diagnostic strategy. What type of diagnostic technician benefits from Real Fixes? Since ShopKey Pro offers a full range of Real Fixes for all diagnostic technicians regardless of skill level, all diagnostic technicians benefit from Real Fixes. Some diagnostic techs are just starting out and could use help building a diagnostic strategy around the common failures associated with a particular code/symptom. A beginning diagnostic technician can use the listing of Real Fixes and Probable Components to understand the full-range of potential problems and build a strategy for their diagnostic job at hand. More experienced diagnostic technicians typically use Real Fixes to find the unique/rare instance of a failure after they have already tested the top two or three likely causes of failure based on their experience. How do technicians use Real Fixes and real-world information as part of a diagnosis? Make sure you do not skip the second and third steps in the 5 step-process above, essentially avoiding “parts swapping”. Skipping those steps leads to comebacks, lost revenue and upset customers. A 2005 MINI Cooper 1.6L S pulls into your shop with the check engine light on. Upon reading the code, you find a P1688 – electronic throttle control monitor level versus mass airflow calculation. The code set condition is because the flow of air going through the Mass Airflow Sensor (MAF) is different from the ECU’s perceived engine load. If we look at the OEM data, it leads us to test the MAF Sensor. 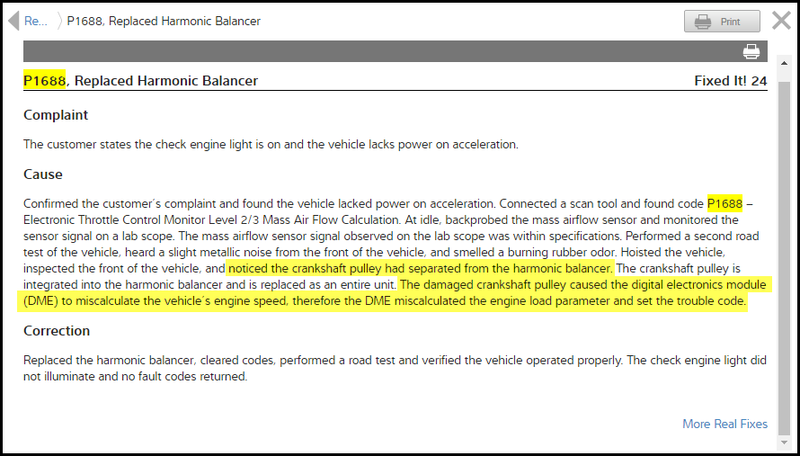 But if we check ShopKey Pro Real Fixes, you have 24 “Fixed It!” counts related to the harmonic balancer. Next:Text Messaging Is The Latest Addition To ShopKey™ Shop Management!